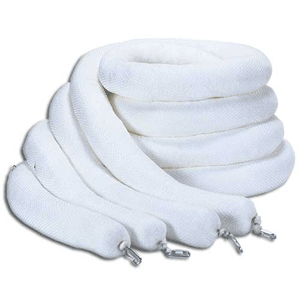 Strong mesh outer sleeve encases a poly sock skin filled with highly absorbent polypropylene. Filler won't shed and booms will not sink when saturated with oil. Sturdy hardware with nylon rope ensure durability and easy retrieval. Booms can be linked together. They clip together with carbon steel connector hardware. Uses: Use on water when you have oil to contain or soak up. Absorbs hydrocarbons only. Repels water. Floats on water. Absorbs all hydrocarbons such as oil, gasoline, fuel oil, diesel and lubricating oils. For additional information on product uses please click here. Absorbent products must be disposed of in compliance with local, state and federal regulations. Since various fluids absorbed may be of toxic or hazardous in nature, Green State Services does not recommend disposal procedures.